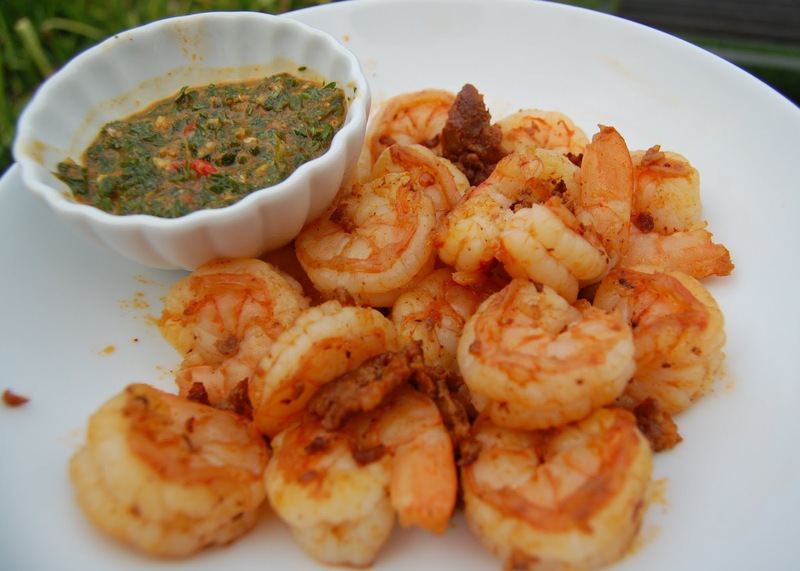 Why not double dose this shrimp with spicy and exotic flavors both? The chorizo gives a nice deep heat and savor while the chermoula sauce adds a top note of piquant green and lemony tang along with a snap of red chili. 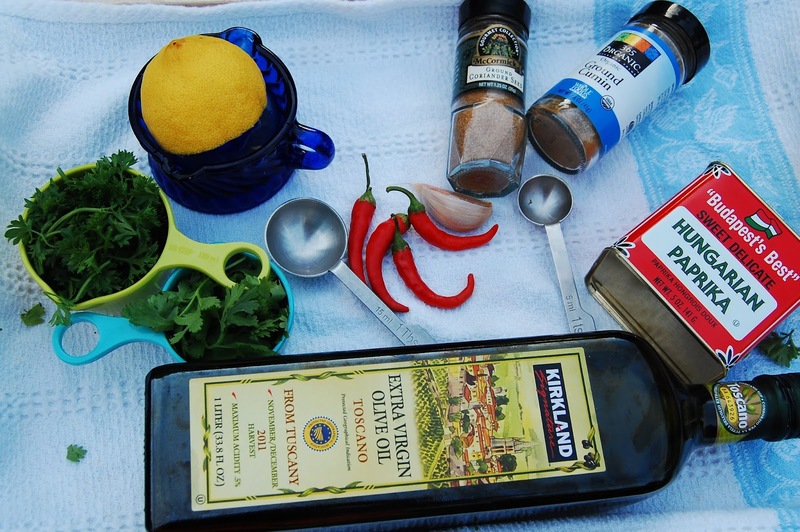 If you haven't heard of chermoula sauce before, I'll bet you soon hear of it again or see it on a trendy menu. It's a traditional Moroccan marinade that seems to be making an appearance in all sorts of dishes these days. I've added a few non-traditional ingredients while keeping the basics. And we're going to make it first so the flavors can mull a bit. A night or two in the fridge would be even better! The greens are cilantro and about twice as much parsley. (So, here I've used 1/4 C Cilantro, 1/2 C Parsley.) 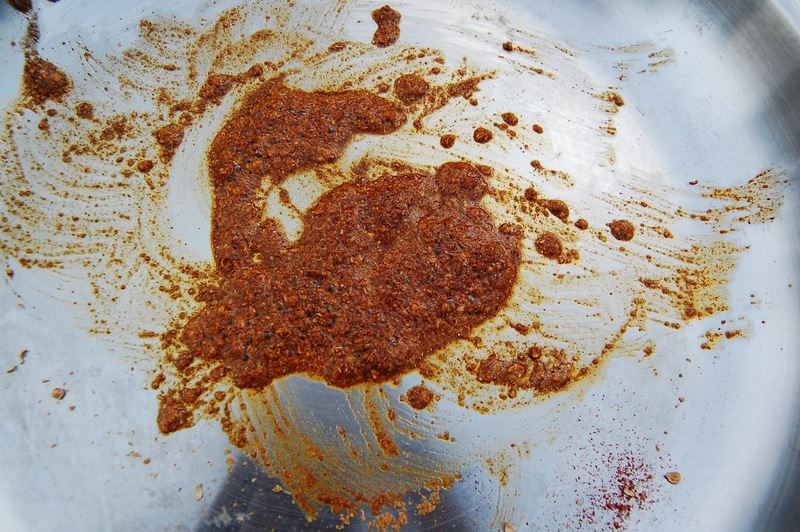 The spices: 1 tsp each of cumin, coriander, and paprika. Unless you use ground coriander often, buy it fresh just before you make this or buy coriander seed and grind it yourself in a clean coffee grinder or mortar and pestle. It should smell like a fresh cut lemon. Anytime you open a spice bottle and smell nothing, throw it away. Just to intensify the flavors of these 3 spices further still, we're going to borrow a tip from India and heat them in a skillet over low heat. 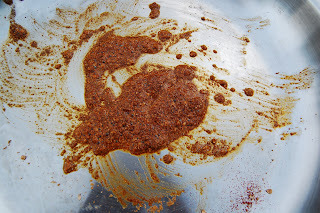 Use just a drizzle of oil with the 3 spices and move it all constantly with a spatula until it bubbles, maybe one minute. It should smell very fragrant. 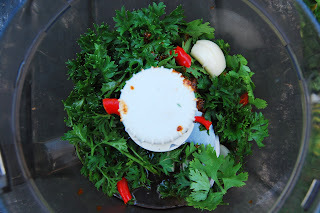 Now drop all the greens, two seeded red chilies, and a garlic clove into a food processor with the heated spices. Process with 2 Tbs olive oil and 2 tsp lemon juice until well combined and smooth. Taste test. I like to add a pinch of sugar to balance that lemon flavor, if the coriander was good and potent. You be the judge. I also like a grate or two of ginger, which is completely un-traditional, but again, try it and judge for yourself. Now it's time for shrimp! 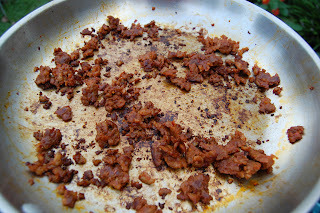 You can thin slice the chorizo if that works. This particular link was almost falling apart when I cut it so I just removed the casing and cooked it in "crumbles" in the skillet. 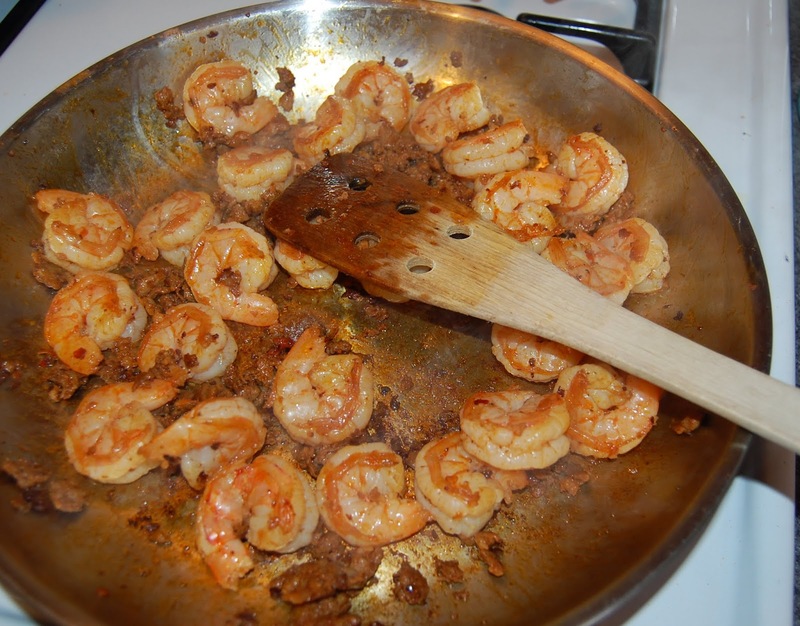 The point is to flavor the skillet before the shrimp hits it, so really let the chorizo brown well and develop a nice fond on the bottom of the skillet. It almost looks too done, doesn't it? That messy looking skillet is just what we want, though. Now, add the rinsed shrimp and stir quickly to pick up all the good bits on the bottom. It will be ready within just 5 minutes or so. 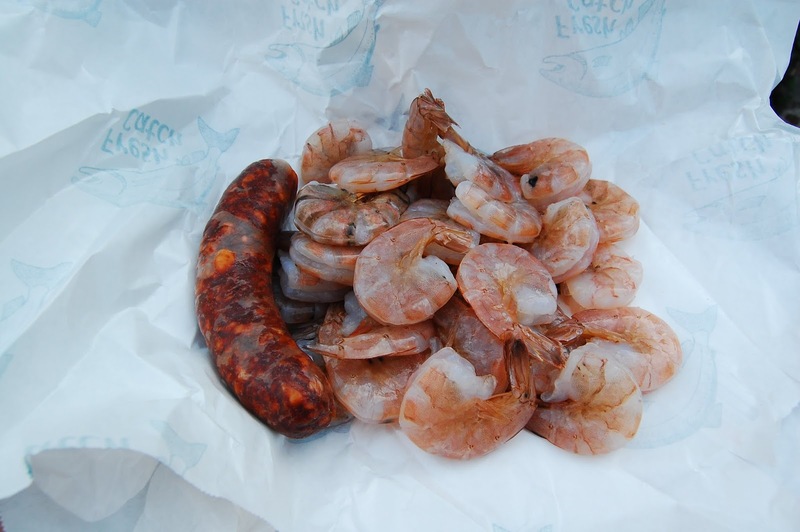 Select the largest shrimp and cut in two to be sure it's white all the way through if you're not sure whether they are all done. Serve with a side of Red Pepper Chermoula Sauce! I have seen chermoula sauce around a lot lately. I love trying new sauces, so definitely have this on my list to make. sounds delicious jan. can't wait to try the chermoula sauce. thinking it would also be good with chicken, fish or even scrambled eggs.